The Father Andrew P. Kashevaroff Building, located at 395 Whittier Street in downtown Juneau, Alaska, houses the State Libraries, Archives, and Museum (LAM), a division of the Alaska Department of Education and Early Development. 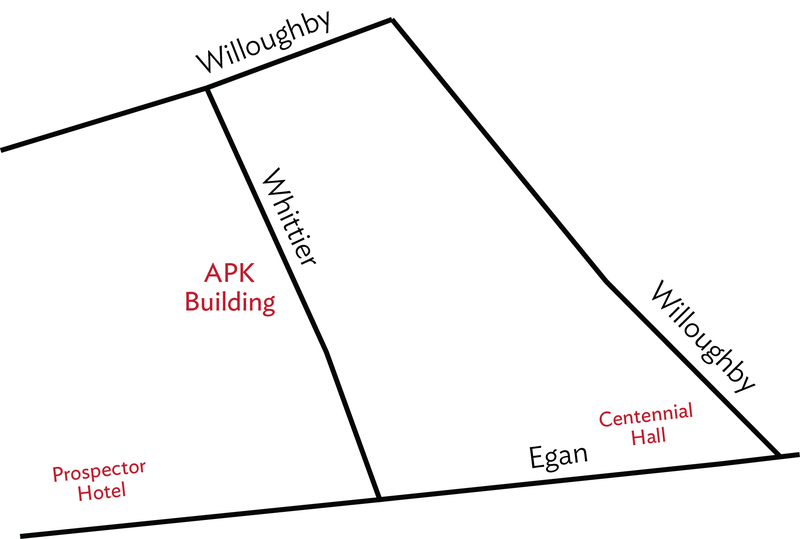 The first floor of APK features the galleries of the Alaska State Museum, a lecture hall, classroom, and cafe. On the second floor resides the Alaska State Libraries and the Research Center where the public may access the Historical Collections and State Archives. An elegant, clerestory atrium provides upward vistas of the mountains surrounding downtown. Access to all levels and featured areas is available via a grand staircase or elevator. Balconies located on the mezzanine level and second floor overlook the atrium floor. Free access to the parking garage, located underneath the facility, is available to building visitors and guests. Coffee, breakfast, and lunch are available from Raven Cafe during regular business hours. To inquire about availability, call (907) 465-2921 or apkrentals@alaska.gov, Monday - Friday, 8 am to 4:30 pm.